The Works and Days (Ancient Greek: Ἔργα καὶ Ἡμέραι, Erga kai Hēmerai)[a] is a didactic poem of some 800 lines written by the ancient Greek poet Hesiod around 700 BC. At its center, the Works and Days is a farmer's almanac in which Hesiod instructs his brother Perses in the agricultural arts. Story of Prometheus and Pandora, and the so-called Myth of Five Ages. Scholars have seen this work against a background of agrarian crisis in mainland Greece, which inspired a wave of colonial expeditions in search of new land. In the poem Hesiod also offers his brother extensive moralizing advice on how he should live his life. The Works and Days is perhaps best known for its two mythological aetiologies for the toil and pain that define the human condition: the story of Prometheus and Pandora, and the so-called Myth of Five Ages. In the Works and Days, Hesiod describes himself as the heir of a farm bequeathed to him and his brother Perses. However, Perses apparently squandered his wealth and came back for what is owned by Hesiod. Perses went to law and bribed the lords to judge in his favour. The poem contains a sharp attack against unjust judges like those who decided in favour of Perses; they are depicted as pocketing bribes as they render their unfair verdicts. Hesiod seems to have thought that instead of giving him money or property which he will again spend in no time, it is better to teach him the virtues of work and to impart his wisdom which can be used to generate an income. Like the Theogony, the Works and Days begins with a hymnic invocation to the Muses, albeit much shorter (10 verses to the Theogony's 115) and with a different focus. The poet invokes the "Pierian Muses" to sing of their father Zeus and his control of the fates of mankind. Through the power of Zeus men might be famous or nameless; he easily strengthens and oppresses the strong, reduces the conspicuous and raises up the inconspicuous; easily he straightens the crooked and withers the many. Hesiod then appeals to Zeus to guide his undertaking: "Hearken, seeing and hearing, and through justice put straight the laws; and may I speak the truth to Perses." and the beggar is envious of the beggar, the singer of the singer. Hesiod encourages Perses to avoid the bad Eris, and not let her persuade him to frequent the arguments in the agora, but to focus on working for his livelihood. Family business follows, as Hesiod implores his brother to join him in sorting out their fraternal discord through the "justice of Zeus". It comes out that they had previously divided their patrimony, but that Perses claimed more than his fair share by influencing "bribe-devouring kings" (δωροφάγοι βασιλεῖς, dōrophagoi basileis). 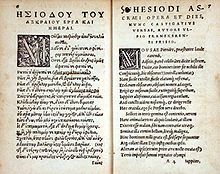 The following few hundred verses—by far the most famous portion of the poem—comprise a series of mythological examples and gnomic statements outlining Hesiod's conception of justice and the necessity of work with the ostensible goal of persuading Perses to follow a proper path in life. The first lesson is why the immortals keep an easy livelihood hidden from mankind: the story of Prometheus and Pandora is the answer. In the Theogony, Pandora and the "tribe of women" had been sent as a plague upon man in punishment for Prometheus's attempt to deceive Zeus of his deserved portion when men and gods were dividing a feast, and for his subsequent theft of fire. In the Works and Days Hesiod proceeds directly to the theft of fire and punishment. Zeus instructed the gods to build an "evil" for mankind: that is, Pandora, whom Prometheus's brother Epimetheus accepted from Hermes despite his brother's warnings never to accept gifts from the gods. Before Pandora's arrival, man had lived free from evils, toil and illness, but she had been given a jar which contained all these curses; this she opened, releasing all its contents but Elpis (Ἔλπις, "Hope" or "Expectation"). The Myth of the Ages follows. In the Hesiodic scheme there were five ages of mankind: the Golden Age, Silver Age, Bronze Age, Heroic Age, and the present age, that of Iron. Race of gold man lived in the time of Cronus, an age of plenty and peace, for the earth gave for all their needs of its own accord and rivalries of any kind were thus unknown. Golden Age man never aged, and when they died they went as though to sleep. When this age came to an end, its population became guardians of mankind, protecting them from evils and granting them wealth. The Silver Age was much worse than the Golden, both in stature and temperament. They lived as children with their mothers for a hundred years. Once they came of age, they lived but a brief time, suffering because of their foolishness. They fought with one another and did not mind the gods. Angry at their impiety, Zeus destroyed the race; still, they are granted the honor of being called "chthonic blessed mortals". The Bronze Race was fearsome and warlike. Their weapons were bronze, they lived in bronze houses, and they wore bronze armour; black iron did not exist yet. They fell at each other's hands and came to an inglorious end. The race of heroes was more just and noble. Though demigods, they too fell in war, most notably those at Thebes and Troy. After death they were transported to the Isles of the Blessed where they lived a postmortem life of plenty similar to the Golden Age. Hesiod then laments that he lived during the Iron Age, which is characterized by toil and hardship. He predicts that Zeus will destroy his race, too, when men are born gray-haired and all moral and religious standards are ignored. Aidos and Nemesis will depart the earth, leaving behind ills against which there will be no bulwark. δεῖπνον δ', αἴ κ' ἐθέλω, ποιήσομαι ἠὲ μεθήσω. νίκης τε στέρεται πρός τ' αἴσχεσιν ἄλγεα πάσχει. You fool, why do you scream? Someone much your better has you. You go wherever I conduct you, songstress though you may be. I shall make you my dinner, if I wish, or let you go. he lacks victory and suffers grief upon grief. Rzach, A. (1908), Hesiodi Carmina (2nd rev. ed. ), Leipzig . Link to text – Editio maior. Rzach, A. (1913), Hesiodi Carmina (3rd rev. ed. ), Leipzig, ISBN 3-598-71418-1 . – Editio minor. Solmsen, F. (1990), Hesiodi Theogonia, Opera et Dies, Scutum (3rd rev. ed. ), Oxford, ISBN 0-19-814071-1 . – 3rd edition of Solmsen's 1970 Oxford Classical Text. Chapman, George (1618). The Georgicks of Hesiod. (Reprinted as: Hesiod's Works and Days. London: Smith, 1888.) Metrical translation. Cooke, Thomas (1743). The Works of Hesiod. 2nd ed. London, 1743. (Reprinted in The British Poets in 100 Volumes. Vol. 88. London: Whittingham, 1822.) Metrical translation. Elton, Charles Abraham. The Remains of Hesiod. 2nd ed. London: Baldwin, 1815. Metrical translation. Evelyn-White, H.G. (1936), Hesiod, the Homeric Hymns, and Homerica, Loeb Classical Library, no. 57 (3rd rev. ed. ), Cambridge, MA, ISBN 978-0-674-99063-0 . Link to the full text of the 1914 first edition. – English translation with introduction and facing Greek text. Johnson, Kimberly (2017), Theogony and Works and Days: A New Critical Edition, Northwestern University Press, ISBN 081013487X. Stallings, A. E. (2018), Works and Days, Penguin, ISBN 0141197528. Verse translation with introduction, notes and index. ^ The Works and Days is sometimes called by the Latin translation of the title, Opera et Dies. Common abbreviations are WD and Op. for Opera. ^ Works and Days 3–8. ^ WD 90–105. There is some debate about the simple and obvious translation of "elpis" as "hope". Some scholars argue that is really should be translated as "expectation" since the root word is from "suppose". And in this context it is argued that what was left in the jar was not Hope as we know it, but the "expectation of ills" so that Man would be unpleasantly surprised by ills that befell him instead of expecting them. Confer W.J. Verdenius, Commentary on Hesiod, et al. Also written in Tandy and Neale's translation of Works and Days. p.64, note 37. Barron, J.P.; Easterling, P.E. (1985), "Hesiod", in P.E. Easterling; B.M.W. Knox (eds. ), The Cambridge History of Classical Literature: Greek Literature, Cambridge, pp. 92–105, ISBN 978-0-521-21042-3 . Cingano, E. (2009), "The Hesiodic Corpus", in Montanari, Rengakos & Tsagalis (2009) (eds. ), pp. 91–130 Missing or empty |title= (help)CS1 maint: Uses editors parameter (link). Sistakou, E. (2009), "Callimachus Hesiodicus Revisited", in Montanari, Rengakos & Tsagalis (2009) (eds. ), pp. 219–52 Missing or empty |title= (help)CS1 maint: Uses editors parameter (link). Hesiod (1810). "Works and Days". English Translations: From Ancient and Modern Poems. 2. Thomas Cooke (trans.). N. Blandford. p. 745.